Four years ago, primetime animation kingpin Seth MacFarlane put his ardor for the Great American Songbook to the test, uniting with arranger and conductor Joel McNeely to record the breezy Music Is Better Than Words. The polished collection of Tin Pan Alley chestnuts and obscurities netted him a Grammy nomination. MacFarlane and McNeely subsequently reunited for a platter of Christmas tunes. Though the press materials for this third teaming make no mention that the disc’s arrival coincides with Sinatra’s centenary, the timing can’t be accidental. The blueprint for these 17 tracks is clearly those mid-to-late-’50s classics-Only the Lonely, No One Cares, In the Wee Small Hours-that explored the somber flipside of Sinatra’s ring-a-ding-ding frivolity. Pieces like "Bullet Train," powered by a contemporary polish and groove, and "Make It Up," with a perky Brazilian flavor, both serve as aural pick-me-ups; forays into French—sly-turned-direct during Serge Gainsbourg's "Les Amours Perdues," emotionally gripping on Léo Ferré's "Avec Le Temps"—leave singular memories hanging in the mist; and scaled back settings like "I Know I Dream," where voice and piano commune with the moment before a stunningly gauzy orchestral draping is drawn around Kent, leave you breathless. Few singers can work their way into a lyric like this. These arrangements—most by Tommy Laurence, a few involving Jim Tomlinson's hand with or without a partner—fit Kent like a glove, playing to her quiet strengths. The material is first-rate, with Jobim gems and French tearjerkers sharing space with appealing songs Tomlinson co-wrote with (either) Cliff Goldmacher, Kazuo Ishiguro, or Antonio Ladeira. And the musicians, of course, deserve high marks in working to the parameters of the Stacey Kent aesthetic. While this is but one more jewel in a discography with many, it's one that deserves singling out for its luster. Double Rainbow; Photograph; Les Amours Perdues; Bullet Train; To Say Goodbye; Make It Up; Avec Le Temps; I Know I Dream; La Rue Madureira; Mais Uma Vez; That’s All; The Changing Lights. Stacey Kent: vocals; Jim Tomlinson: saxophones, alto flute, percussion; Graham Harvey: piano, Fender Rhodes, keyboard; John Paricelli: guitars; Jeremy Brown: double bass; Joshua Morrison: drums; Curtis Schwartz: electric bass (4); Erika Matsuo: station announcement (4); Martin Burgess: violin; Amanda Smith: violin; George Salter: violin; Katie Stillman: violin; Lorraine McAslan: violin; John Mills: violin; Andrew Storey: violin; Richard Milone: violin; Paul Wiley: violin; Rob Bishop: violin; Jenny Godson: violin; Catherine Morgan: violin; Matthew Ward: violin; Jeremy Morris: violin; Clare Hayes: violin; Richard Blayden: violin; Richard George: violin; Alison Dods: violin; Susan Briscoe: violin; Takane Funatsu: violin; Fiona Bonds: viola; James Boyd: viola; Ian Rathbone: viola; Nick Barr: viola; Chian Lim: viola; Reiad Chibah: viola; Martin Loveday: cello; Nick Cooper: cello; Will Schofield: cello; Judith Herbert: cello; Juliet Welchman: cello; Julia Graham: cello; Vicky Matthews: cello; Chris Laurence: bass; Richard Pryce: bass; Lucy Shaw: bass; Eliza Marshall: flute; Sarah Newbold: flute; Patricia Moynihan: flute; Siobhan Grealy: flute; Holly Cook: flute; Jamie Talbot: clarinet, alto flute; Time Lines: clarinet; Tom Lessels: bass clarinet; Steve Morris: contrabass clarinet; John Thurgood: French horn; Corinne Bailey: French horn; Joanna Hensel: French horn; Andy Sutton: French horn; Sue Blair: harp; Adrian Bending: vibraphone, percussion. 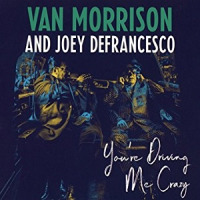 Van Morrison has been busy, releasing three recordings in quick succession, Roll With the Punches (Exile, 2017), Versatile (Exile, 2017), and presently You're Driving Me Crazy with jazz organist Joey DeFrancesco. At this point in his career, Morrison can pretty well sing what he damn well pleases. On his past several recordings, Morrison has revisited his catalog, recasting some of his older songs in new frames and You're Driving Me Crazyproves no exception. Revisited here are "The Way Young Lovers Do" from Astral Weeks(Warner Bros, 1968), "All Saints Day" from Hymns to the Silence (Polydor, 1991), "Close Enough for Jazz" from Born to Sing: No Plan B (Blue Note, 2012). The presence of Joey DeFrancesco must be noted for the refinement and aplomb he brings to Morrison's beautiful "Magic Time," infusing the piece with an easy-listening grace. The pair breath a gently-swinging life into Morrison's "Have I Told You Lately" (from Avalon Sunset (Mercury, 1989)), while recasting Inarticulate Speech of the Heart's "Celtic Swing" as a breezy romp featuring Morrison's alto saxophone and Dan Wilson's electric guitar. The pair lay down the blues on Morrison's "Goldfish Bowl" from What's Wrong with this Picture (Blue Note, 2003). It would not be fair to DeFrancesco to label this as a "Van Morrison" recording, but it is that. What DeFrancesco brings to the table is the integrating feature of his exceptional musicianship and swing. The two click best on the old war-horses: "Travelin' Light" and "Every Day I have the Blues" where their music making is effortless. And that is what we have become accustomed to from Morrison, music too easily made and enjoyed. It is not often that nature smiles so generously upon us, but it has done so in Van Morrison. Miss Otis Regrets; Hold It Right There; All Saints Day; The Way Young Lovers Do; The Things I used to Do; Travelin’ Light; Close Enough for Jazz; Goldfish Bowl; Evening Shadows; Magic Time; You’re Driving Me Crazy; Every Day I have the Blues; Have I Told You Lately; Sticks and Stones; Celtic Swing. Van Morrison: vocals, saxophones; Joey DeFrancesco: Hammond organ, trumpet; Dan Wilson: guitar; Michael Ode: drums; Troy Roberts: saxophone. Pianist Joey Alexander knows how and when to strike the ivories. At the age of 14 he has already recorded two GRAMMY-nominated studio albums, My Favorite Things (Motema Music, 2015) and Countdown (Motema Music, 2016). Late in 2017, Alexander released Joey.Monk.Live! (Motema Music), a critically acclaimed surprise release to honor Thelonious Monk's centennial. 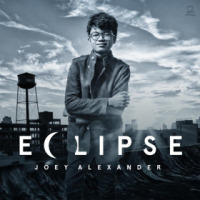 Alexander has released his third studio album entitled, Eclipse. The eleven selections are mixture of originals and standards, demonstrating his aptitude as a composer (Alexander composed six of the eleven tunes), arranger, bandleader, and player. Joining Alexander is a rhythm section of bassist Reuben Rogersand drummer Eric Harland, and guest appearances by saxophonist Joshua Redman on three tracks. Alexander's original "Bali" opens the disc in a celebratory mood, with a relaxed melody that has nice interaction between the bass and melodic figures. The Latin-ish straight eight feel is a perfect setting for Alexander's playful solo approach, and after Rogers mellow solo, Alexander begins the dance. His lines are clear and defined by clean phrasing and rhythm. He takes his time to build in intensity, developing each melodic fragment to a logical completion before moving on to the next idea. The trio has a very relaxed feel and joy about their playing and they are obviously are having fun playing together. "The Very Thought of You" has guest artist Redman on the track. Alexander starts the tune of with a solo piano version of the melody. With intricate inner voice leading and smooth rhythmic styling, Alexander takes some very interesting harmonic turns, that are sure to delight. Redman enters and restates the melody; the duo is in symbiosis with each other and blend beautifully. Redman's solo is beautiful, his upper register work is impeccable. The two interact in a way that is conversational highlighting what a good listener Alexander is. Eclipse is a wonderful third outing by Alexander. There is a nice range of tempos and feels, reflective moments and dramatic displays of virtuosity, and even moments of free group improvisation. Alexander is a confident and creative player that has a trio that converses with trust and respect. Adding the amazing sound of Redman, and you have a magical, musical journey. It's all about exploring the many possibilities of emotion that is Eclipse. Bali; Faithful; Draw Me Nearer; Moment’s Notice; Blackbird; Eclipse; Fourteen; The Very Thought of You; Space; Time Remembered; Peace. Joey Alexander: piano; Ruben Rogers: bass; Eric Harland: drums; Joshua Redman: saxophone.